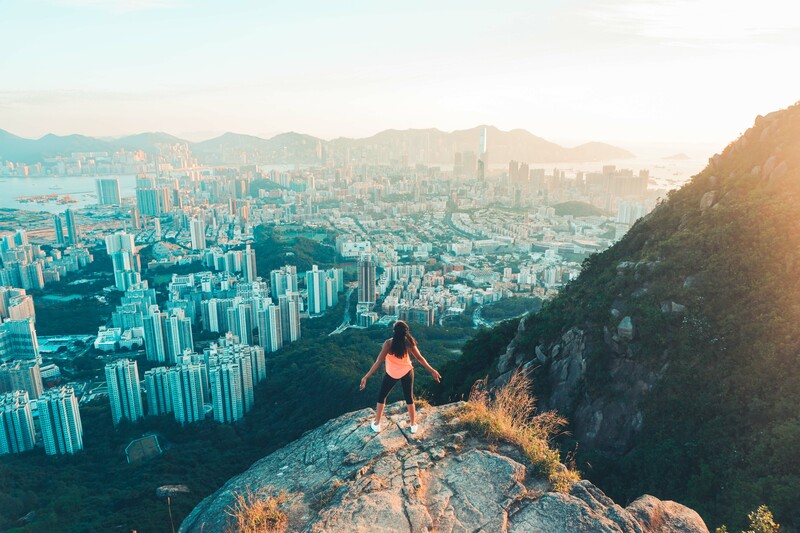 If you thought Hong Kong was just skyscrapers and bright lights, guess again. It’s a mix of both dazzling cityscapes and the jaw dropping landscapes that surround it. 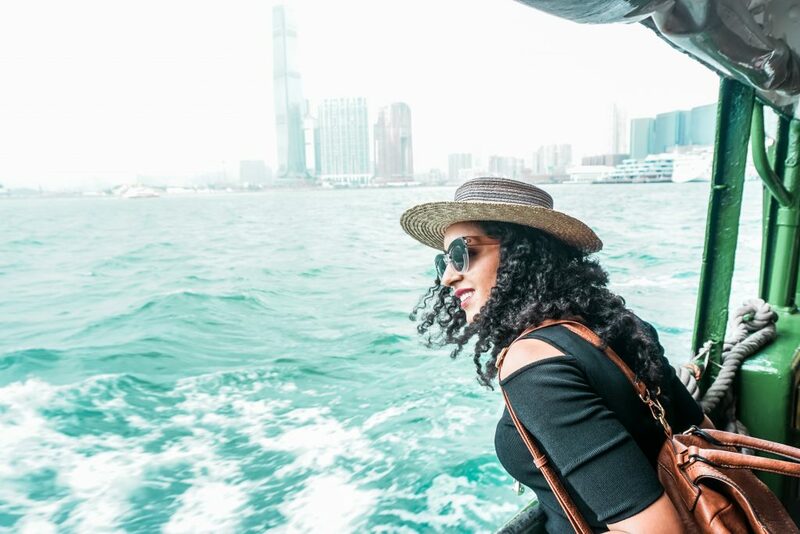 Here are my top 15 favorite things we did in Hong Kong during our honeymoon. 1. 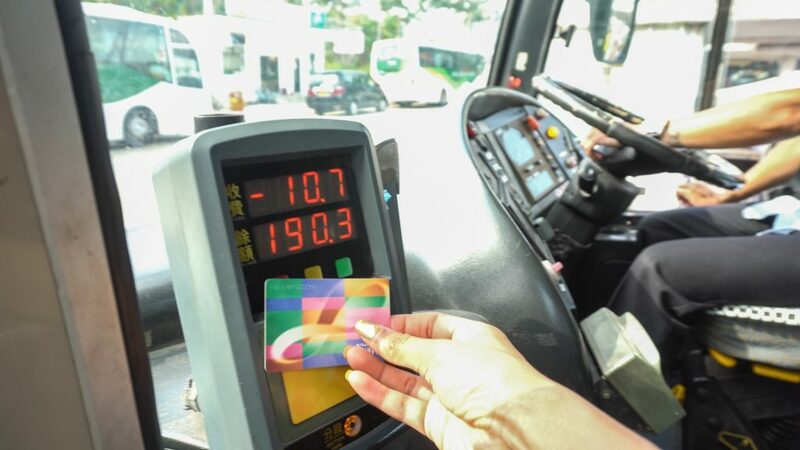 Buy an Octopus Card before you do any exploring. The handy little Octopus Card is accepted all over Hong Kong! We used it to get around the city by bus, train, tram and ferry. Whenever you need to reload your card, you can do it at several places, including any 7 Eleven. When you leave Hong Kong, you can return the card and get any money back that’s left on the card. 2. Hop on the Star Ferry. Star Ferry boats are a pleasant way to see Victoria Harbour. Ferry rides in Hong Kong are also a popular way to get around, but I’d consider avoiding the high speed ferries—apparently the increase in fast ferry traffic has been gravely endangering Hong Kong’s pink dolphin population. 3. 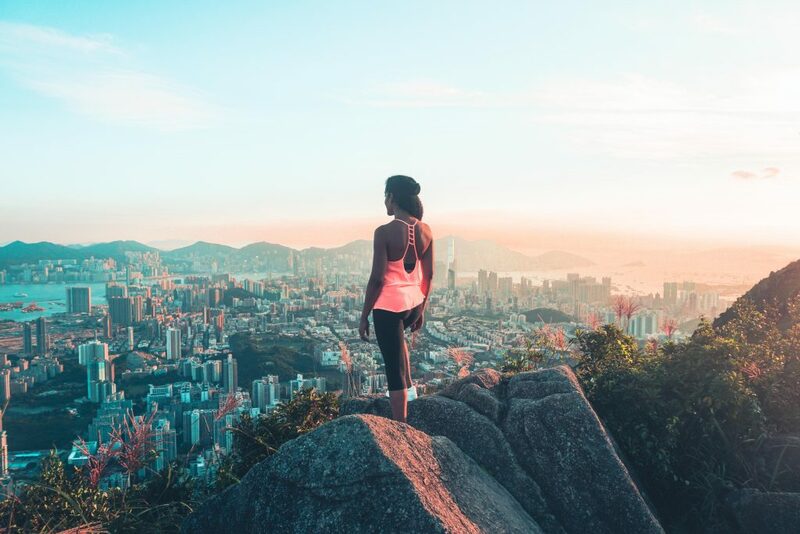 Take in the view from Victoria Peak. 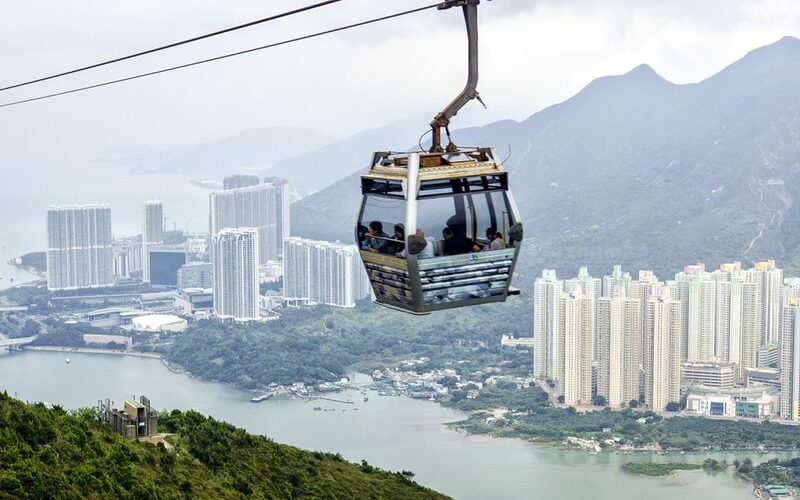 While this is the more touristy way to see the Hong Kong skyline, it’s one you can’t leave without experiencing. We rode up by bus, which is the cheaper route, and rode back down by Peak Tram. At Victoria Peak, you can enjoy the skyline for free or you can pay to go up further to the Sky Terrace 428 for the highest panoramic view. 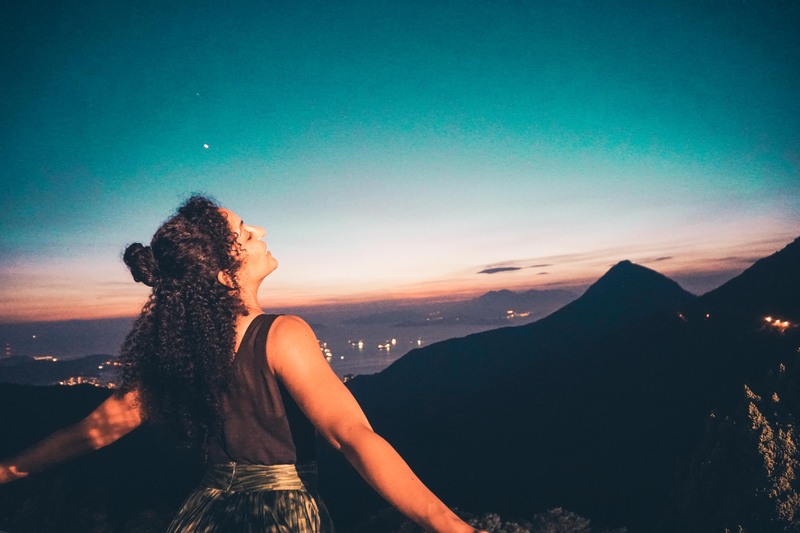 To me, the view is even better than Victoria Peak, and it’s free. It’s not very popular amongst tourists, which is why it was so great. I only ran into a few locals who were all very friendly, so even though I tackled this hike alone, I never felt unsafe. ALTERNATIVE: If you want a more touristic hiking option, opt for Dragon’s Back. 5. Get drinks at OZONE. A more posh way to experience a good view is to sip a cocktail at a rooftop bar. 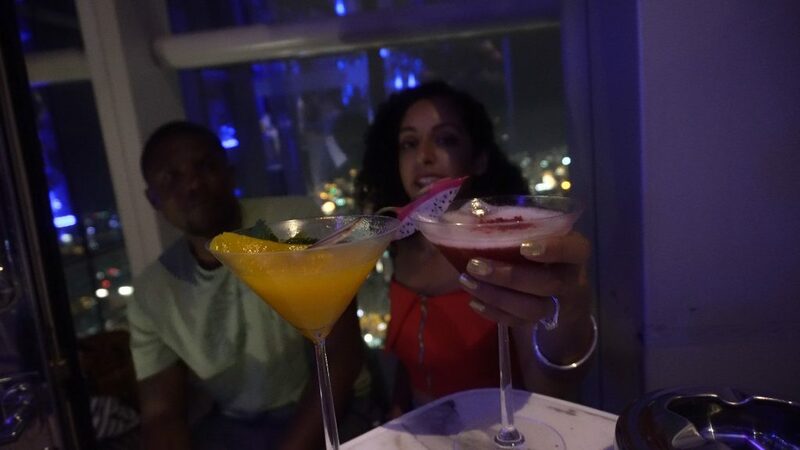 We went to OZONE, the rooftop sky bar on the 118th floor of the Ritz Carlton. Beware though; they strictly enforce their dress code after 9pm. That means no shorts, beach sandals, open toe shoes, or sleeveless shirts for the fellas once the clock strikes 9. 6. Wake up to a good view. There are plenty of hotels in Hong Kong with amazing views, but we chose Hotel Icon. They’ll even pick you up in a Tesla, my favorite car company, if you book one of their clubs or suites for 2 or more nights. 7. See a Symphony of Lights. 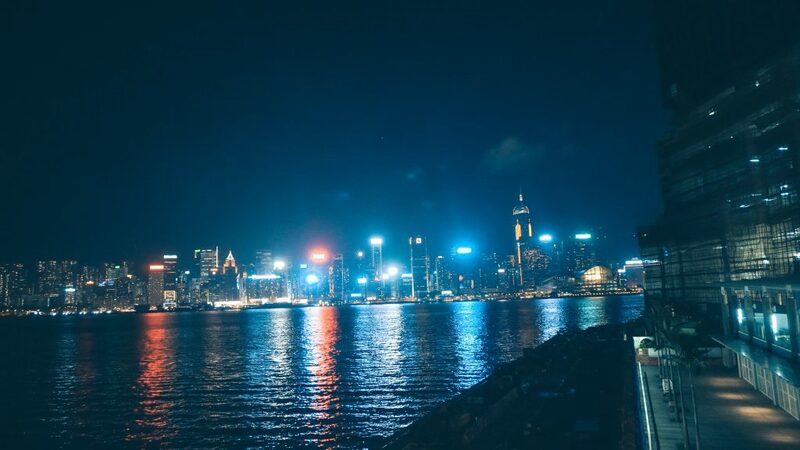 Every night at 8pm, you’ll see colorful lights and laser beams bursting from the skyline on both sides of Victoria Harbour. It’s called A Symphony of Lights and it’s quite the spectacle. 8. Stroll along the Promenade. 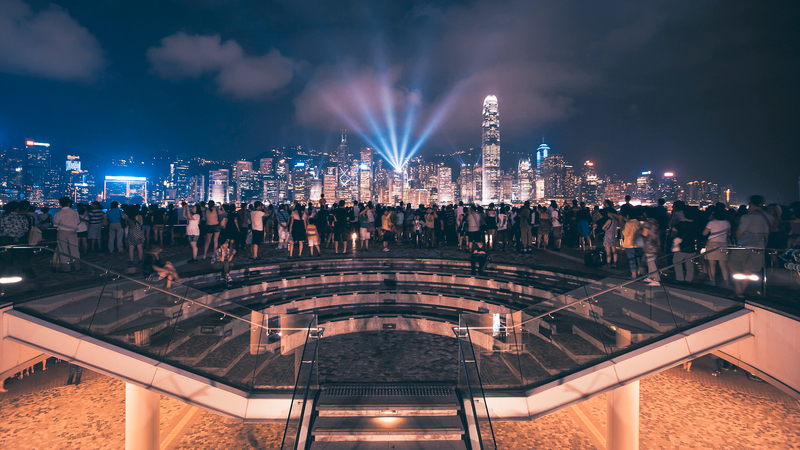 For more amazing views, walk along the Tsim Sha Tsui Promenade where you can enjoy gazing at the architecture right along the water. 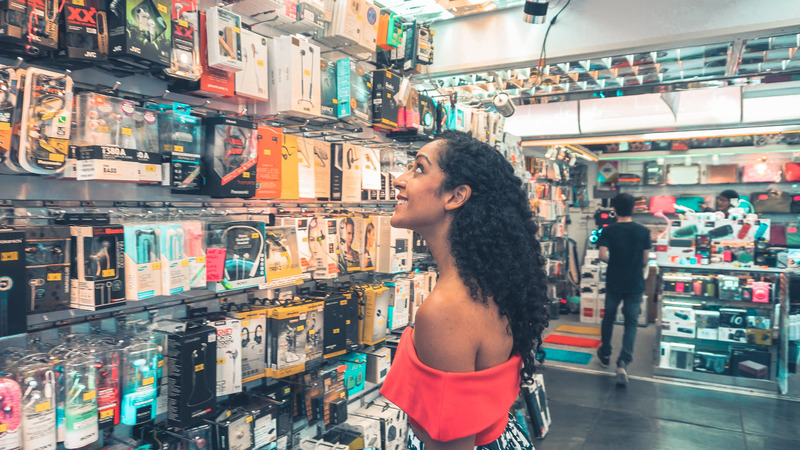 Although it’s not as cheap as it was several years ago, if you go to the right places, you might be able to find some good bargains. We went to the Mongkok Computer Centre. 10. Experience the Street Markets. 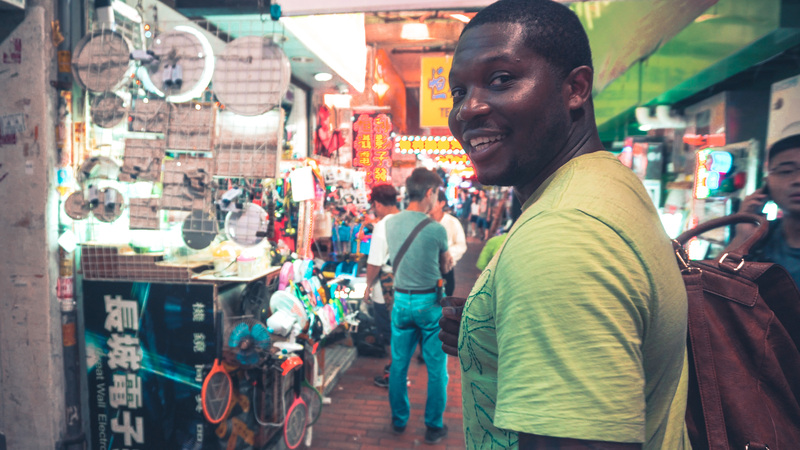 We went to Temple Street Night Market where Karl got to practice his negotiation skills. He wound up getting the price down on a really cool karaoke microphone…that he never uses. 11. 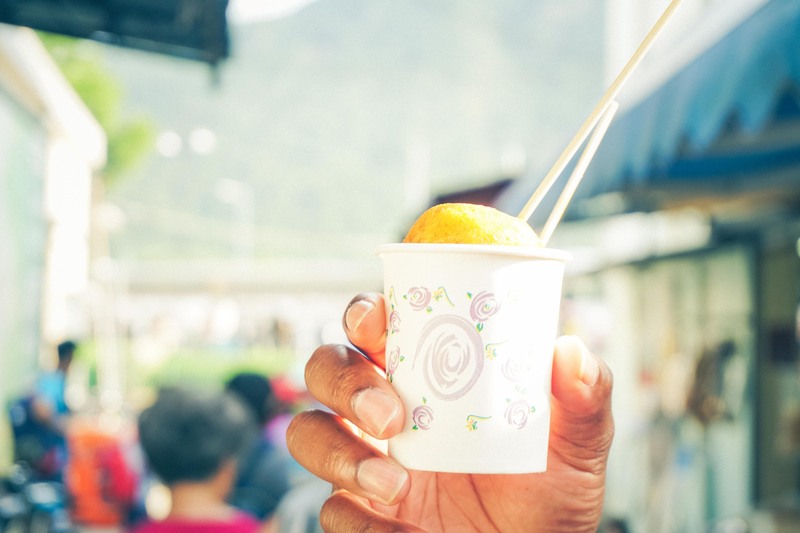 Try some street food. 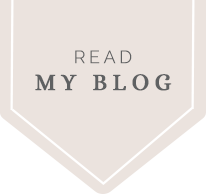 You’ll have plenty of opportunities for this! Hong Kong is especially known for their dim sum, so don’t leave without trying some. 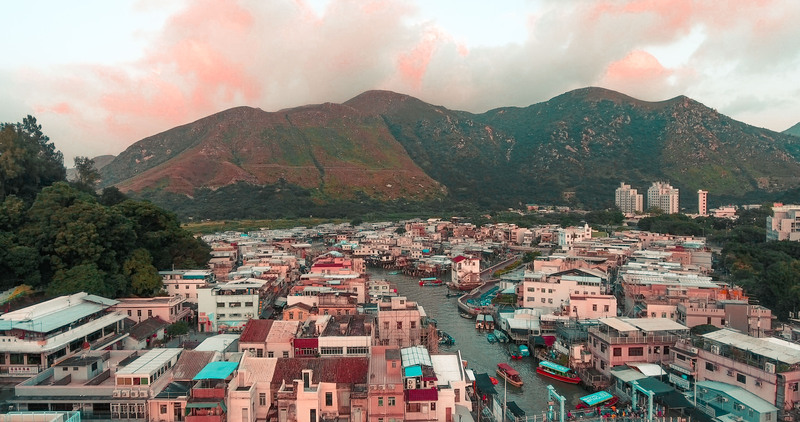 For a more cultural experience, visit this fishing village on stilts located on Lantau Island. Here you can walk around the village, eat traditional Cantonese food, and take a boat tour. 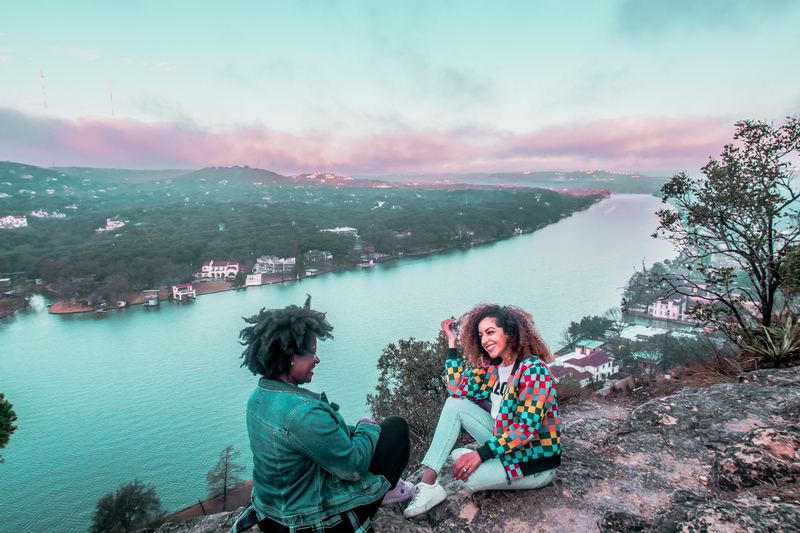 The boat tours often advertise pink dolphin sightings, but sadly these beautiful creatures are in danger of becoming extinct due to pollution and large scale construction. 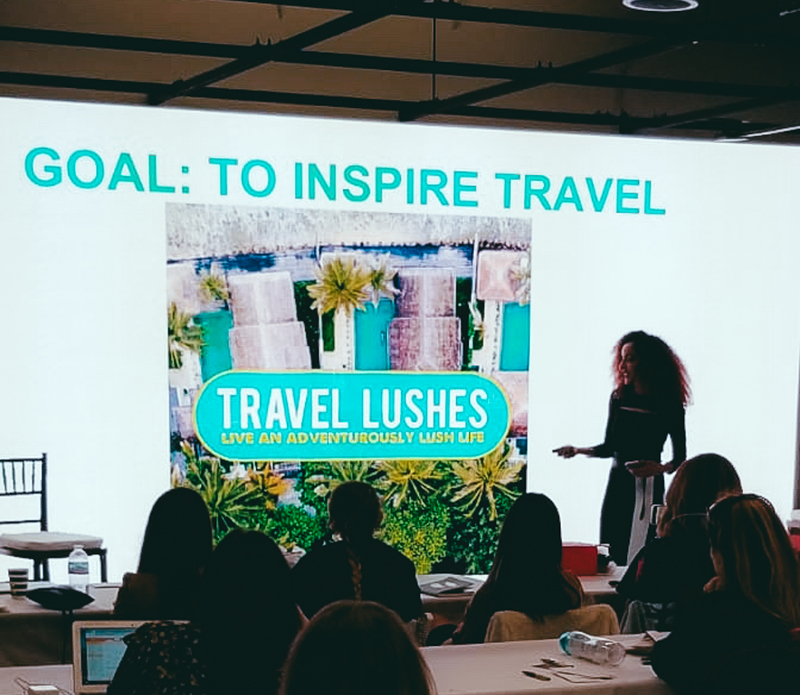 You can help them by following some of my Eco-Friendly Travel Tips, like avoiding plastic. You can also contact Hong Kong’s ferry companies to ask them to slow down or sign the petition to reroute ferry traffic. Boat Rides: HK $20 ($2 USD) Prices are negotiable. 13. 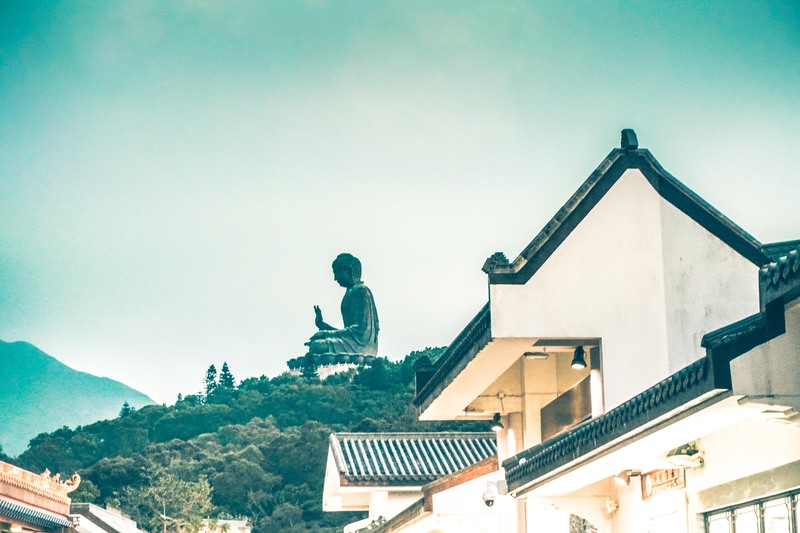 See the Big Buddha. You can do this during the same excursion you make to Tai O village since it’s nearby. 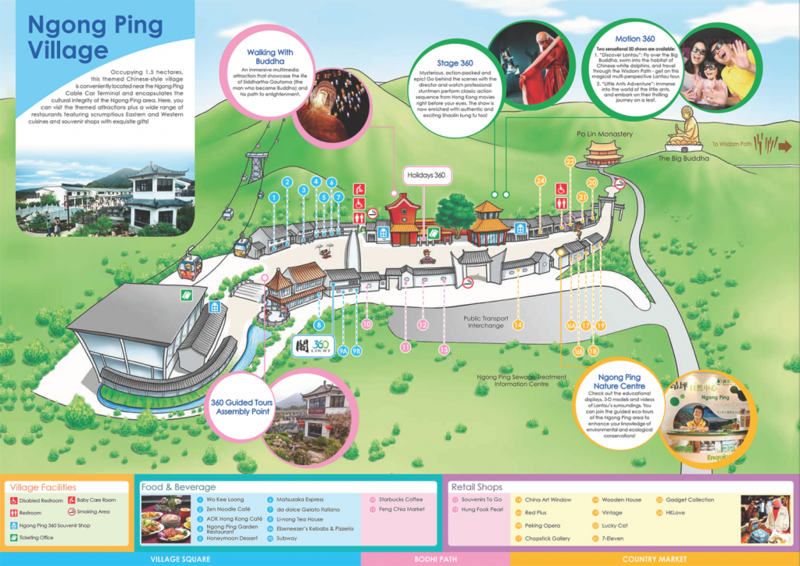 While visiting the Big Buddha, you can also stop at Ngong Ping village. Buuuut, heads up, don’t expect a traditional cultural experience. This is a more commercialized area, complete with Western familiarities like Starbucks and Subway. For some beautiful scenery, you’ll want to take a ride on the NP360 at least once. You can do it round trip, but we chose to just take the gondola one-way on our way back. It’s best to do this while it’s still light out though. Unfortunately, we didn’t quite make it before sunset. Also when you leave Hong Kong, don’t forget to turn your Octopus Card in to get refunded for the remaining balance on the card!